Nanays, are you looking for fun and exciting outdoor activities for your children this summer? You can choose from these Zoomanity Group theme parks located in nearby Luzon provinces and Bohol in Visayas. Read on and find out what these different theme parks have to offer and get ready to experience unforgettable yet affordable family adventures this summer. Guests can expect an astonishing sight of diverse animals such as tigers, crocodiles, snakes and lizards roaming around this 50 hectare land. See them exploring freely in this simulated natural habitat. You don't need to trek the mountains to explore the forests, Zoobic Safari lets you experience walking along terrains, streams, and grasslands. 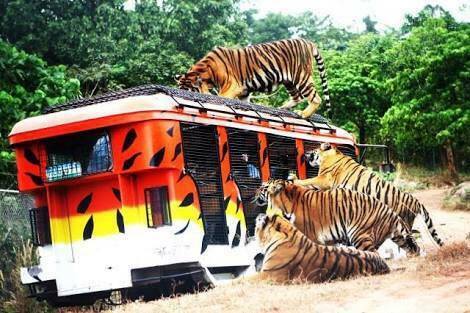 It also known as the only Tiger Safari in the Philippines found at the Subic Bay Freeport's Forest Adventure. Spend the weekend with your family at Paradizoo Farm in Mendez, Cavite. Enjoy a fine, sunny day in a place full of rich gardens and farm animals. Let your kids enjoy the peaceful and relaxing farm life with different animals such as the llama, camels, miniature horses, ostriches, greyhounds, labrador retrievers. They can even experience a carabao ride around the farm! Feel the cold breeze while enjoying the breathtaking view of Tagaytay at Residence Inn. This Tagaytay hideaway offers the perfect location to view Taal Lake. Kids will surely love the place because of its Mini Zoo. Families will enjoy the local dishes especially the famous Tagaytay bulalo and tawilis served at the Gazebo. Besides the great view, ambience and service, Residence Inn is also known as one of the most affordable places to stay in Tagaytay. Don't forget to try the Zipline overlooking Taal Volcano. You'll be surprised on how far your tight budget will bring you. Zoocolate Thrills is the only adventure theme park in Loboc, Bohol managed by Zoomanity Group. This promising tourist destination in Bohol offers captivating attractions such as river cruises for those who want to explore the Loboc River and encounters with different animals like ostriches, tigers, and bearcats. They also offer tram ride, horse/buffalo ride and zip/zing ride. Zoocobia is a complete educational and fun experience in the beautiful, lush, forested foothills of the extended Clark Freeport Zone. Zoocobia offers a one of a kind ecological experience. 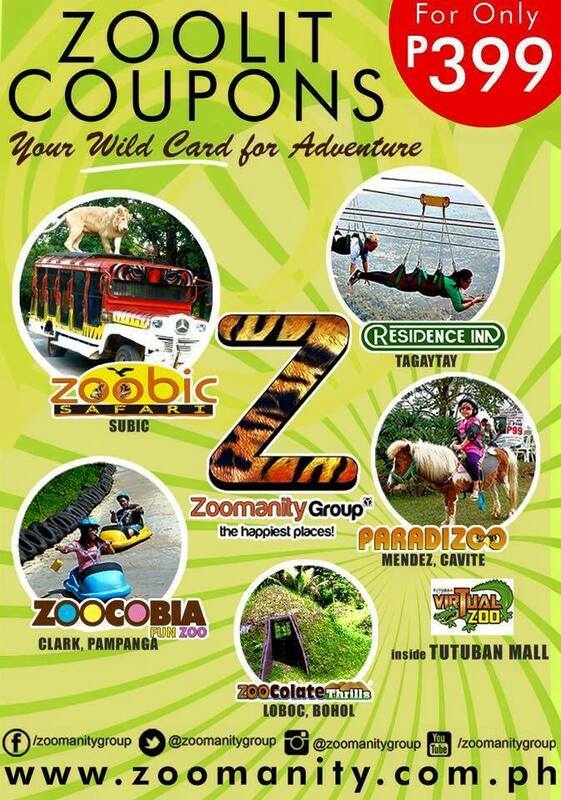 Avail of these great promos from Zoomanity!